We offer a variety of futon mattresses for every occasion. We can also make custom mattresses if you have a non-standard or specific idea. You can pick-up your futon mattress in store in Montreal or have it delivered in most areas of Quebec and Canada. All our cotton and foam mattresses and natural latex mattresses are handmade in Quebec since 1981. Click on each futon for more details. Durability : Measure the resistance to compression over the years. Variable depending on the usage, the weight and maintenance. Firmness : Measure of the mattress comfort. A personal choice depending on individual taste. Firm is not necessarily better. 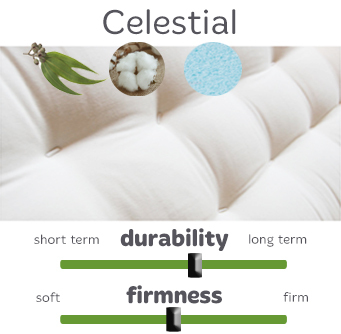 The Celestial futon is a good choice for a comfortable sofa and a guest bed. More resilient than recycled polyester, the polyurethane foam core provides a good support and a good durability. Excellent quality/price value for a sofa or a guest bed. The Ekono is a good quality/price value futon mattress. Very popular with students or as a guest bed. The envelope is black. Made in a non-removable black cover. Perfect as a sofa bed or as an occasional bed. The Flex futon was specially designed for frames that require a flexible mattress. It's the best option for metal frames with sides that can be lifted or for a studio lounger frame. The high-density of polyurethane foam core provides a good support and a good durability while the layers of fibers will embrace the curves of the frames. The high percentage of fiber layers will result in a greater compression but it is still the best option for frames that need a flexible mattress. 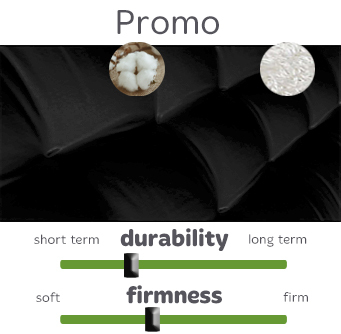 The Promo is thinner than the other futons so it can be folded on itself on specific frames. It’s a perfect match for the Turin A frame. The envelope is black.